Here it is: teeny tiny foodie’s first official recipe since the big move from Brooklyn to the suburbs! 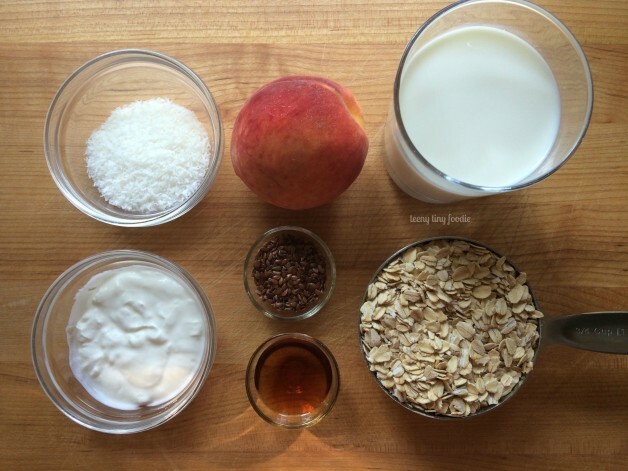 Just in time for back to school, I’m sharing an easy make-ahead breakfast recipe that will make your morning routine a little easier: Peaches & Cream Overnight Oats. 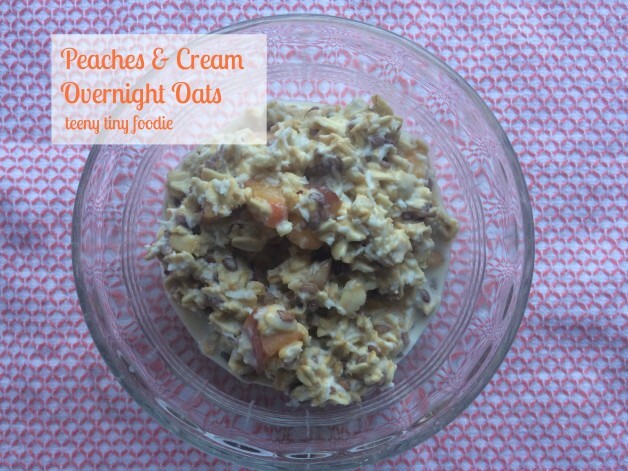 Overnight oats is one of my most favorite fast and easy make-ahead breakfasts. I love that you just toss all the ingredients into an air-tight container and leave it for at least 6 hours (or overnight) and your breakfast is ready to go! This is also a perfect recipe for a young sous chef to help put together because he or she can’t go wrong when pouring the ingredients into the container. Older sous chefs can help with the measuring or even chopping, too. 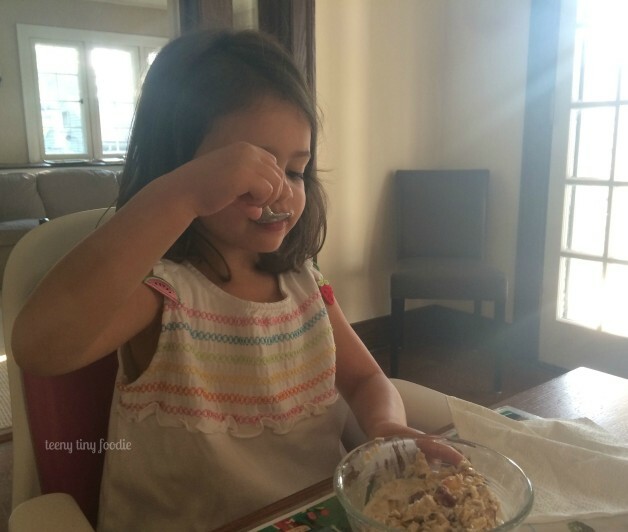 Visit this recipe for Purple Overnight Oats for more ideas, including photos, of how your little one(s) can help you make this breakfast. Yields 1 generous adult serving. Divide recipe in half to make a toddler serving. This will last 2-3 days in the fridge. Add all the ingredients, except toppings, to an air-tight container. Mix well and refrigerate for at least 6 hours or overnight. 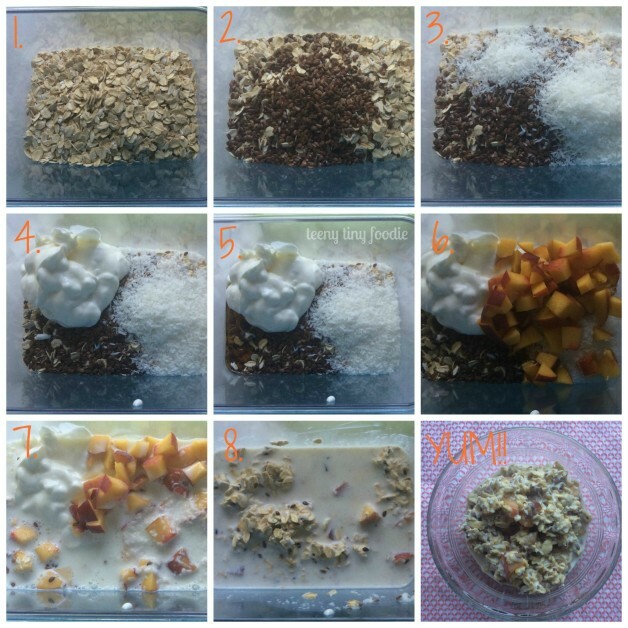 Before enjoying, stir the oats well, top with additional toppings, if desired, and enjoy! If you prefer them warm, heat them in the microwave for 30 seconds to 1 minute to remove the chill. Don’t forget to stir them well in order to heat the oats evenly.